Picture-sharing app will keep 'small cut' of each sale it makes in-app. Instagram is testing a new feature that will allow users to buy products in-app without leaving the platform. Checkout, a beta program that launched today, will enable transactions to be made within the Instagram app, with payments processed by PayPal. The Facebook-owned picture-sharing platform will keep a "small cut" of each sale made on Instagram, it announced in a blog post. Previously, users had to swipe up on a product or image on Instagram Stories to be taken to that brand’s website in order to buy the item. Now, by tapping on a "View the product" button, users will see a "Checkout on Instagram" option. Twenty brands, including Adidas and Burberry, are partnering Instagram, which has limited the trial to mobile users in the US. Oz Etzioni, chief executive and co-founder of personalised video ad specialist Clinch, said the update allows Instagram to close a full shopping experience from inside its walls, while it could significantly increase online sales for direct-to-consumer brands that are digitally-savvy. He explained: "It shortens the time period and actions required in each step of the traditional [sales] funnel by providing enhanced product discovery, via stories, influencers, social connections, collection and feed ad units and now even via Facebook Messenger. Product research is almost completely gone as it becomes an integral part of the product discovery (as you discover it via people you follow, trust and inside your main go-to content and discovery platform). However, he warned: "The big question mark is what kind of data and to what extent the brands and retailers will get back from the Instagram platform, which could truly hurt their CRM and control over their own user base data and insights." This is a similar dilemma brands face when increasing sales online via Amazon: even though sales are up, the brand is unable to retain and analyse consumer data from Amazon sales. Instagram first began testing ecommerce features on its platform in 2016 and last year quietly began launching an in-app payments feature that allowed some users to book appointments for restaurants and salons. 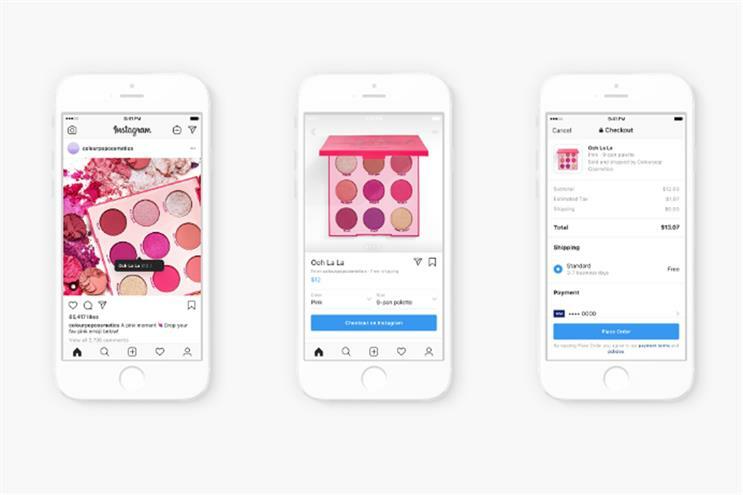 However, Born Social’s strategy director Callum McCahon warned last year that in-app shopping on Instagram would not be a game-changer for social commerce, because users would need to already be predisposed to the brand or product. McCahon wrote in Campaign: "Very rarely will someone see a product on Instagram for the first time and immediately purchase. That makes this new feature a great tool for bottom-of-the-funnel activity, but not something that will drastically improve your revenue from Instagram overnight. I’ll bet that the vast majority of people who purchase using this feature will have purchased anyway. They’ll just have a nicer experience doing it."